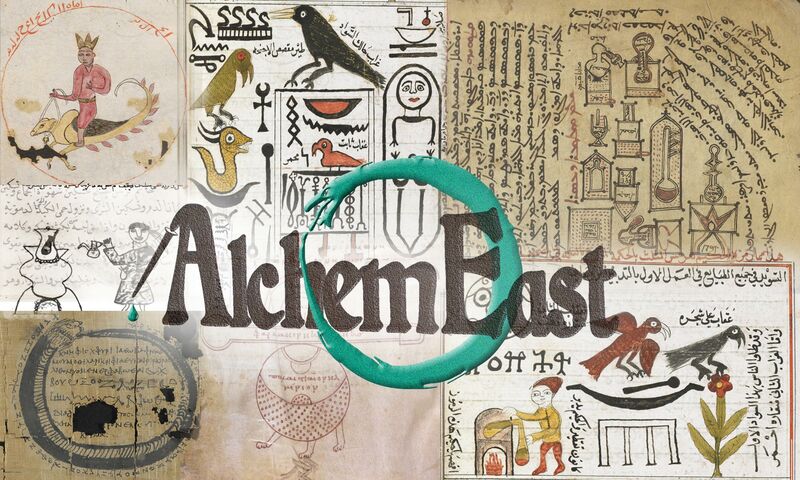 AlchemEast – The AlchemEast project is devoted to the study of alchemical theory and practice as it appeared and developed in distinct, albeit contiguous (both chronologically and geographically) areas: Graeco-Roman Egypt, Byzantium, and the Near East, from Ancient Babylonian times to the early Islamic Period. The AlchemEast project is devoted to the study of alchemical theory and practice as it appeared and developed in distinct, albeit contiguous (both chronologically and geographically) areas: Graeco-Roman Egypt, Byzantium, and the Near East, from ancient Babylonian times to the early Islamic period. This project combines innovative textual investigations with experimental replications of ancient alchemical procedures. It uses sets of historically and philologically informed laboratory replications in order to reconstruct the actual practice of ancient alchemists, and it studies the texts and literary forms in which this practice was conceptualized and transmitted. It proposes new models for textual criticism in order to capture the fluidity of the transmission of ancient alchemical writings. the different forms in which Syriac and Arabic scholars repackaged the earlier tradition. AlchemEast will move the origins of alchemy back in time by looking east. Up to now, the Eastern alchemical tradition has only been superficially investigated. Even these few attempts were often led astray by out-of-date historical paradigms. Medieval and early modern alchemy has been often labelled as a ‘pseudo-science’ and described as a set of foolish attempts to transform base metals into gold. AlchemEast will dismantle this pejorative paradigm. Ancient alchemy, in fact, went far beyond the making of gold, since it included a wide spectrum of techniques for manipulating row materials in order to produce dyed metals, artificial gemstones, coloured glass, purple textiles, and a variety of chemical compounds. The project will fully explore these techniques and investigate how they were described and conceptualized in dialogue with contiguous areas of expertise. Particular attention will be devoted to the intersections between alchemy and medicine as well as alchemy and natural philosophy. Both alchemy and medicine, for instance, developed specific criteria for the classification of substances and their properties; ancient alchemical compendia include sections from the works of important physicians, who are even presented as distinguished alchemists in some instances. The explanations of specific dyeing procedures and the transformations that they were expected to produce were often developed in the framework of specific theories of matter. Moreover, alchemists sought to produce materials that were ontologically equivalent to the natural substances, suppressing the contrast between the realms of natural and artificial. These transformations were even conceptualized as a possible way of perfecting the work of nature in a dynamic interaction of alchemy with Gnosticism, Neo-Platonism, and Hermeticism. Alchemical practices were therefore embedded in networks of theoretical assumptions, beliefs, and philosophical commitments, which were historically influenced by different milieux. In order to fully reconstruct these networks, we will carry out a comparative investigation of cuneiform tablets as well as a vast corpus of Greek, Syriac and Arabic writings. 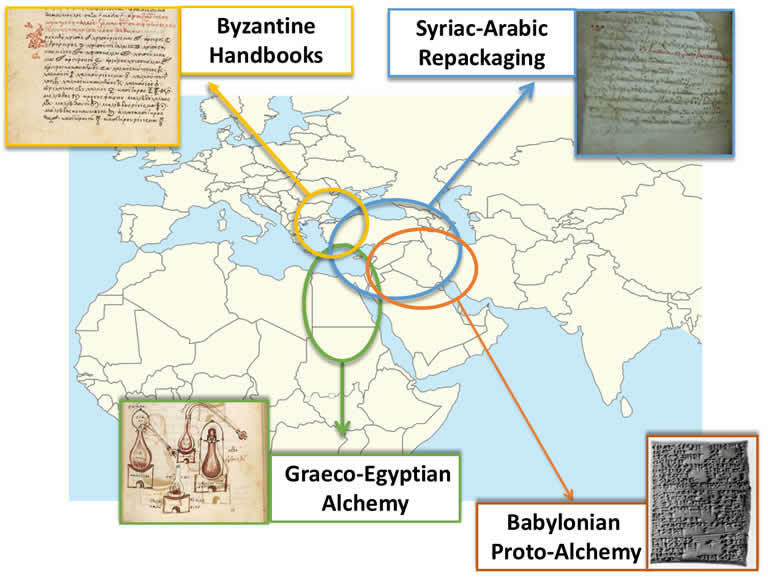 We will produce reliable editions of so far unstudied alchemical sources in Akkadian, Greek, Syriac and Arabic. We will write a new history of alchemical ideas and practices in Antiquity, in order to provide an integrative, longue durée perspective on the many different phases of ancient alchemy. We will carry out philologically informed replications of ancient alchemical processes in order to restore the operational basis of ancient alchemy and anchor ancient alchemical texts in their chemical reality. The project will thus offer a radically new vision of ancient alchemy as a dynamic and diversified art that developed across different technical and scholastic traditions. This new representation will allow us to connect ancient alchemy with medieval and early modern alchemy and thus fully reintegrate ancient alchemy in the history of pre-modern alchemy as well as in the history of science more broadly.